The following is our understanding of the final agreement counter offer for the above referenced sublease proposal, which we make on behalf of our client, ______________, (“Sublessee”). This proposal pertains to all of the office space, including parking rights, presently occupied by ___________, (“Sublessor”) in the building indicated below, pursuant to that certain lease (“Master Lease”) dated _________, between _____________ (“Master Landlord”) and Sublessor. Sublessee's offer is subject to the execution of mutually agreeable sublease documentation and the approval thereof by Sublessee's board of directors. XYZ BUILDING, 1234 Main Street. Approximately ________ square feet of office space. All measurements are to be based upon BOMA standards of usable and rentable square feet and are subject to architectural review. The initial term of this Sublease shall be approximately five (5) years and four months and shall terminate upon expiration of the Master Lease. The Sublease shall commence on ________ 1, 20__. Sublessee shall be permitted to enter the Building and Premises fifteen (15) days prior to the anticipated commencement date for the purpose of installing furniture, fixtures and special improvements. Sublessee shall not be charged for use of elevators, for move-in, electrical consumption or other costs during construction occurring during such period. Months 1-4: Rent shall be abated. Months 5-64: $______ month, flat, net of separately metered utilities and interior janitorial. Sublessor shall be responsible for all other operating expenses for the project including all future rent increases. Sublessor shall be responsible for, including but not be limited to, taxes, insurance, all interior and exterior maintenance and landscaping. Sublessee shall pay the first $_______ annually for all maintenance costs. Sublessor shall be responsible for any excess thereafter. The building shall be maintained in a first class manner. The first month's rent shall be due upon execution of the Sublease. Sublessee shall have the option to renew the Lease for the Premises for up to one (1) additional term of five (5) years in accordance with the terms of the Master Lease. Sublessee shall have the right to engage a space planner of its choice relative to the preparation of preliminary working drawings and design with the cost of such services to be the Sublessor's responsibility, at a cost to Sublessor not to exceed $_________. Sublessor shall pay to Sublessee $_______ upon lease execution for such space planning in addition to the tenant improvement allowance. Sublessee will be responsible for review and code compliance of Sublessee's preliminary working drawings. The Sublease shall provide that any disputes shall be resolved under the rules of the American Arbitration Association or such other procedures as are mutually acceptable to both parties. This Sublease ("Sublease") is made and entered into as of the ____th day of ______, 20__ by and between Original Tenant Corporation, a _______ corporation ("Sublessor"), whose address is 8888 North Pacific Boulevard, Anytown, Anystate 90055, and Sublessee, Inc., a ________ corporation ("Sublessee"), whose address for the purpose of this Sublease shall be 1234 Main Street, Anytown, Anystate 92009. A. Sublessor leases a certain building located at 1234 Main Street, Anytown, Anystate 92009 pursuant to that certain Lease dated _______, 20__ by and between Original Landlord Corporation. as lessor, and Sublessor as lessee, which Lease has been supplemented and amended pursuant to an amendment dated ____________. The Lease, together with the amendment thereto, are collectively hereinafter referred to as the "Master Lease", a copy of which is attached hereto as Exhibit A. Original Landlord Corporation is the lessor under the Master Lease and is hereinafter referred to as the "Master Landlord". 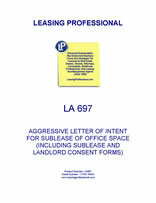 B. Sublessor desires to sublease to Sublessee the property currently leased to Sublessor under the Master Lease, and Sublessee desires to sublease the property from Sublessor. 1. Leasing and Description of Property. Subject to the terms, conditions and covenants set forth in this Sublease, Sublessor hereby leases to Sublessee, and Sublessee hereby leases from Sublessor, the property located at 1234 Main Street, Anytown, Anystate 92009, as more particularly described in Exhibit A to the Master Lease, together with all improvements located thereon (the "Subleased Premises"). 2. Term. The term of this Sublease shall commence on ________, 20__ and shall end on ________, 20__, unless sooner terminated in accordance with the terms of this Sublease. At any time after ________, 20__, Sublessee shall be allowed to enter the Subleased Premises for the sole purpose of installing Sublessee's personal property and otherwise preparing the Subleased Premises for Sublessee's occupancy. Sublessee shall be allowed such access to the Subleased Premises without the obligation to pay rent or charges for electrical consumption and other similar operating costs. Sublessee hereby agrees to indemnify and hold Sublessor harmless from and against any and all claims, losses, liabilities and expenses (including reasonable attorneys' fees) that arise in any way from Sublessee's early occupancy of the Subleased Premises. 2.2 Termination of Master Lease. If the Master Lease shall terminate for any reason whatsoever, then this Sublease shall thereupon immediately and automatically terminate; provided, however, no such automatic termination shall relieve either party from its responsibility for damages, if any, in the event that a breach of this Sublease by a party hereto leads to such termination. 3.1 Base Rent. From ________, 20___ to and including ________, 20__, Sublessee shall be allowed to occupy the Subleased Premises without paying "base rent". From ________, 20__ to and including the end of the initial term of this Sublease, Sublessee shall pay to Sublessor as base rent for the Subleased Premises a monthly rental equal to $_______. Upon the consent hereto of Master Landlord, Sublessee shall pay to Sublessor $________ as a prepayment of base rent for the period ________, 20__ to ________, 20__. On ________, 20__, Sublessee shall pay to Sublessor $__________ as base rent for the period from ________, 20__ to ________, 20__. Thereafter, base rent shall be payable on the first day of each calendar month during the term of this Sublease. 3.2 Additional Rent. In addition to base rent, Sublessee shall pay to Sublessor, as "additional rent", all additional items of expense that Sublessee is required, pursuant to any provision of this Sublease, to pay to Sublessor. Sublessee shall pay amounts of additional rent to Sublessor within 10 days of Sublessee's receipt of Sublessor's bill therefor. 3.3 Manner of Payment. All base rent and additional rent shall be paid to Sublessor at the address set forth in the first paragraph of this Sublease or at any other place designated in writing by Sublessor. All base rent and additional rent shall be paid hereunder without notice, demand, deduction, abatement, setoff or counterclaim, in lawful money of the United States of America, except where this Sublease specifically provides for the granting of a rent credit to Sublessee.